Since I mentioned togging up in my last post, I thought I’d do a quick blog about my winter cycling kit. This winter has been very mild but it’s still bloody cold bowling along on a bike. My average speed is about 21-21kmph and descents can easily get up to 45kmph, so wind protection is paramount. So is rain protection – this is Normandy after all – and I never set out without waterproofs either on my back, or in the rackbag. On Sunday, when it was about 6 degrees and very windy, I set out in the following, most of which have been reviewed elsewhere on this site: high-vis Sawako helmet, fleece balaclava from Intersports, Active zip-neck merino top from Devold, a man’s Craghoppers zip-neck microfleece top (longer than women’s wear), Mountain Warehouse Adrenaline high-vis jacket, high-vis pink Duragloves, Sheila Moon winter cycling tights under Rohan Troggings, knee-length Woodlander mohair socks from Corrymoor and New Balance WX624AB3 running shoes in black leatherette. In my rackbag was the ultra-light Spark gilet from Rohan, microfleece gloves from Land’s End with long wrist sections, a Georgia In Dublin Rainwrap (review to follow) and this microfibre balaclava from Ebay, which I did stop and put on. 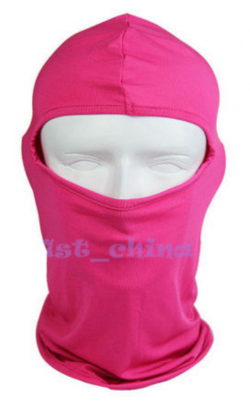 It has a smaller face hole than my fleece balaclava, so protects more of my skin, especially around the temples where the fleece is held out by my glasses. Without glasses, I think I would have been in trouble with the cold wind too. A few rides ago, I also taped Scotch tape over the holes in the front of the helmet, as the ventilation was reaching uncomfortable levels. I am very happy with all of this kit. Wearing ordinary shoes rather than cycling shoes means my feet stay warm and dry, and the Corrymoor socks are as warm as toast. 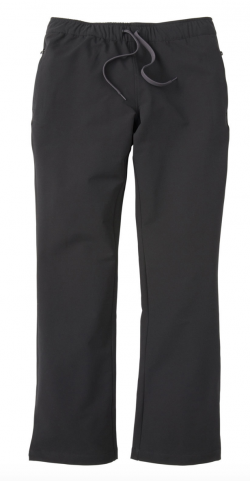 The Rohan Troggings – my normal day trouser – are reasonably windproof, with handy deep zip pockets and brush-clean outer fabric, and teamed with the ankle-length brushed nylon Sheila Moon tights, nothing much gets through. But when it rains, I now add the Rainwrap, which also acts as a handy third windproof layer even in the dry. The Devold top (which has little polka dots that you can’t see in this image) is pretty and very comfortable to wear, and since it folds double at the neck, by the time I was fully togged, I had six layers of protection at my neckline – always a danger area for me. The Duragloves, meanwhile, although not specifically for cycling, are proving absolutely brilliant – nicely windproof, good and grippy and still warm even when wet. Recently I forgot to dry them off after a ride and had to wear very expensive rabbit-fur lined leather gloves from Liberty which were hopeless in comparison. The Duragloves are so cheap I might get a few more pairs to keep in the car and as spares. 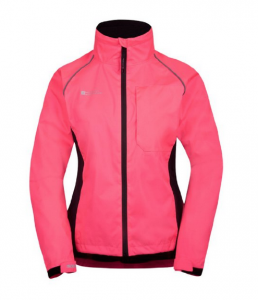 I am not hugely enamoured of the Mountain Warehouse jacket because of its cheap feel – the DH’s Endura (which cost four times the price) feels much nicer. But it’s perfectly efficient and well designed, I just don’t like the cheap and crispy feel of the fabric. 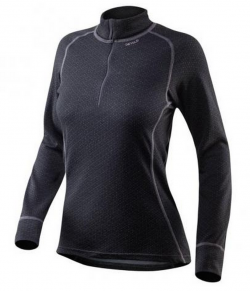 When I have the dosh, I’ll replace it with an Endura Luminite, provided I can find one in my size – always a problem with cycling clothing, which assumes that women have neither breasts nor hips.